Simple arrabbiata recipe, using just olive oil, garlic, chilli and salt. Easy and fast to cook, yet not bland. I created this Arrabbiata recipe one night (back in November 2009) as I felt like having something simple, but with oomph! The word all'arrabbiata means "angry style" but I was feeling quite the opposite that evening. I had a nice long nap and was feeling rather peaceful. Perhaps because of that, I wanted something really simple. This is not the regular arrabbiata sauce, but a stripped down version using just garlic, chilli, oil and salt. I left out two major ingredients in the more traditional arrabbiata recipe - tomatoes and basil. How much simpler can things get? In a very simple recipe like this, the quality of ingredients, especially the oil, is crucial. So use a good quality extra virgin olive oil as the base. Here, I added toasted sesame oil for a slightly more complex flavour. Like olive oil, there is great variation in the quality of toasted sesame oil and I find that those from Japan and Korea tend to be better. Most organic brands of sesame oil sold in health stores are good too - Mitoku toasted sesame oil being particularly fragrant. In Singapore where I am, there are several brands of cheap sesame oil. Having tried the better oils, I won't use the cheap local brands anymore. Some people might feel that the flavours clash, since sesame and olive oil each has a very distinctive flavour. I thought the combination was interesting but if you are more conservative in taste, just stick to olive oil. Or try olive oil with butter. Finely cut the garlic and chilli, or blend coarsely in a food processor. Heat the olive oil in a heavy pan. Add the garlic, chilli and salt, and fry for about two minutes, until fragrant. 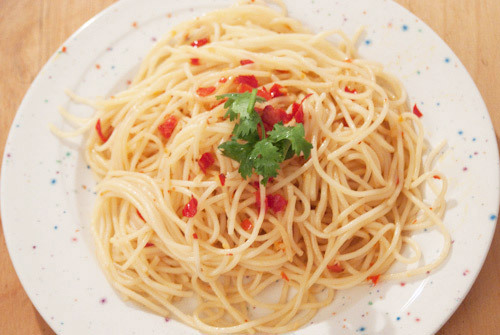 Toss in the cooked pasta and serve, garnished with coriander. Me being Asian, I am used to more chilli and garlic and I find the usual arrabbiata recipe presented in cookbooks to be too mild. If you are not used to the spicy flavour, reduce the amounts to maybe half. As this recipe is rather spartan, eat it with some vegetables and protein (meat / fish etc) side dishes. Click here for a traditional arrabbiata recipe.